11.1.1917: Launched by Cook, Welton & Gemmell Ltd, Beverley (Yd.No.340E) for George William White & John William Willows (joint owners (64/64)), Grimsby as WAR DUKE. 21.3.1917: Left Hull in tow for Grimsby for machinery to be fitted. 20.4.1917: Alick Black appointed manager. 21.4.1917: Registered at Grimsby (GY1037). 7.5.1917: Vessel mortgaged (64/64) to The London Joint Stock Bank Ltd, London (A). 5.1917: Requisitioned for war service as a minesweeper (1-12pdr) (Ad.No.1268). Based Buncrana. 15.1.1918: By Deed Poll. Name of Alick Black changed to Alec Black. 2.2.1918: Alec Black became Sir Alec Black, Bart. By 12.3.1919: Returned to owner at Grimsby. 30.7.1919: Sold to The Yarborough Steam Fishing Co Ltd (64/64), Grimsby. 30.7.1919: John Edward Rushworth appointed manager. 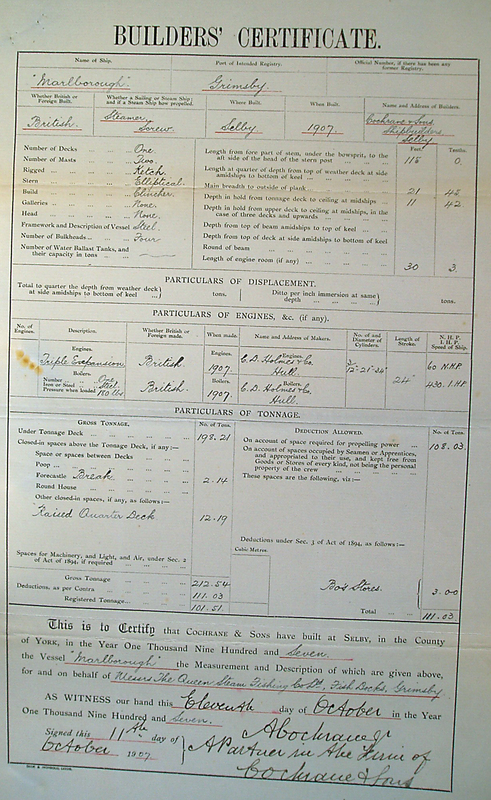 31.7.1919: Vessel mortgaged (64/64) to John Edward Rushworth, Grimsby for the sum of £10,750 with interest at 5% (B). 31.8.1920: Vessel mortgaged (64/64) to Barclays Bank Ltd, London (C). 25.7.1924: Sold to Harold Bacon (16/64); James Norman Bacon (16/64), both Grimsby; Arthur Gladstone Bacon (16/64) Scartho & Frederick Newton Shubands (16/64), Burton-on-Trent. 2.8.1924: Harold Bacon designated managing owner. 31.12.1929: Harold Bacon died intestate. 5.6.1930: Administration granted to Gertrude Catherine Bacon, Edwin Bacon Snr & Charles George Martin (joint owners (16/64)). 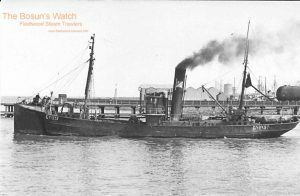 5.8.1930: Sold to Kottingham Trawling Co Ltd (64/64), Grimsby. 5.9.1930: James Norman Bacon appointed manager. 29.11.1939: Requisitioned for war service as a minesweeper (P.No.FY.582) (Hire rate £71.15.0d/month). Based Grimsby. 7.12.1939: Vessel mortgaged (64/64) to Barclays Bank Ltd, London (D). 14.3.1941: Charles George Martin appointed manager. 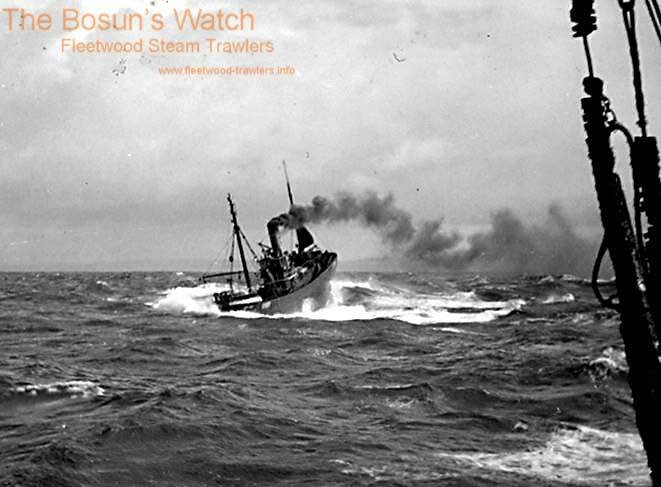 3.1.1944: Sold to Parkholme Trawlers Ltd (64/64), Fleetwood. 3.1.1944: Harvey Wilfred Wilson appointed manager. 18.1.1944: Vessel mortgaged to National Provincial Bank Ltd, London (E). 12.1944: Employed on miscellaneous Naval duties. 30.7.1949: Sold to Trawlers Grimsby Ltd (64/64), Grimsby. 30.7.1949: Harvey Wilfred Wilson appointed manager. 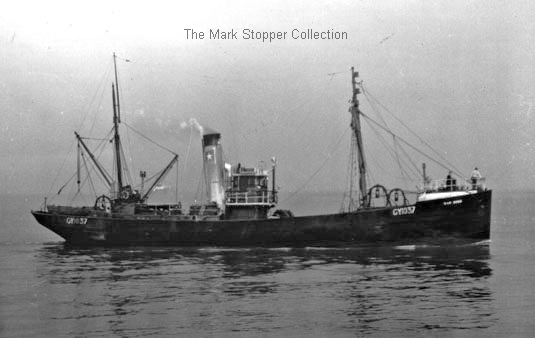 10.4.1953: Sold to Derwent Trawlers Ltd (64/64), Grimsby. 11.4.1953: Harvey Wilfred Wilson appointed manager. 9.2.1955: John Carl Ross appointed manager. 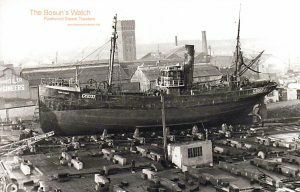 11.1.1956: Sold to Alfred Bannister (Trawlers) Ltd (64/64), Grimsby. 19.1.1956: Fred Bannister appointed manager. 10.12.1959: Homeward in heavy weather in North Sea (Sk. G. Ireland), responded to distress from motor trawler JANET HELEN (LO93) (Sk. Ernest Neal) disabled 30 miles SE of Flamborough with flooding in engineroom. On arrival found crew had taken to liferaft and all five were recovered safely. Skipper and mate returned to vessel, tow connected and course set for Humber estuary. After about 13 miles, a heavy sea swept her and she started to settle, foundering 14 miles from Spurn Point. Survivors landed at Grimsby. 1963: Sold to J. J. King & Co Ltd, Gateshead for breaking up. 26.4.1963: Arrived Tyne from Grimsby under own power. 27.5.1963: Grimsby registry closed “Vessel broken up”. 20/01/2018: Removed FMHT watermarks. Added an image. This entry was posted in Steam Trawlers, Steamers (Picture) and tagged Parkes, Parkholme Trawlers on June 23, 2010 by Fred Smith. 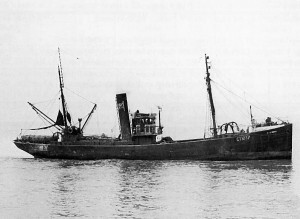 29.6.1907: Launched by Cochrane & Sons Ltd, Selby (Yd.No.414) for Queen Steam Fishing Co Ltd (64/64), Grimsby as MARLBOROUGH. 14.10.1907: Registered at Grimsby (GY306). 14.10.1907: Charles Abraham Osborne appointed manager. 17.9.1908: Vessel mortgaged (64/64) to The Lincoln & Lindsey Banking Co Ltd, Lincoln (A). 12.1914: Requisitioned for war service as a boom defence trawler. Based Humber. 27.11.1939: Requisitioned for war service as a minesweeper (Hire rate £53.5.0d/month). 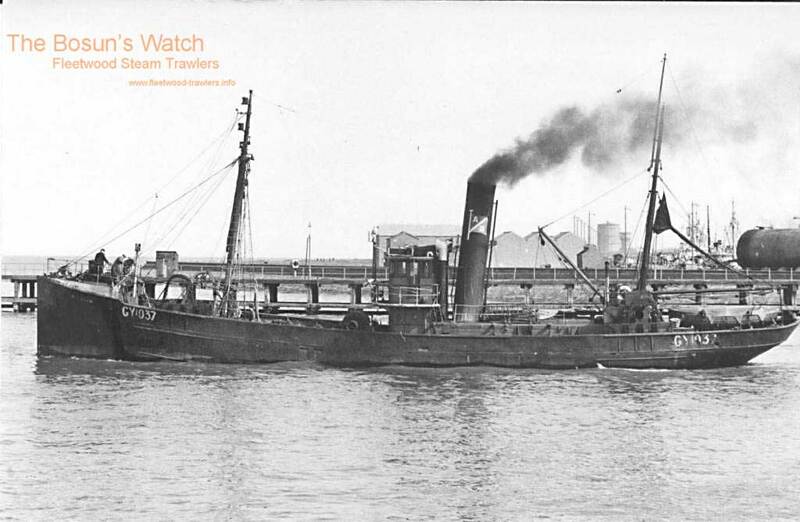 16.11.1944: Sold to Parkholme Trawlers Ltd (64/64), Fleetwood. 16.11.1944: Harvey Wilfred Wilson, Grimsby appointed manager. 22.11.1944: Vessel mortgaged (64/64) to National Provincial Bank Ltd, London (B). 13.11.1952: Sold to Wilfred Taylor (64/64), Fleetwood. 17.11.1952: Sold to Boston Deep Sea Fishing & Ice Co Ltd (64/64), Fleetwood. 18.11.1952: Basil Arthur Parkes, North Ferriby appointed manager. 5.12.1952: George Hewson Smith, Grimsby appointed manager. 6.1954: Sold to BISCO and allocated to C. W. Dorkin & Co Ltd, Gateshead for breaking up. 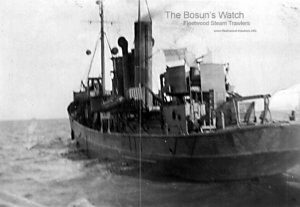 30.11.1954: Confirmation by BISCO that vessel had been broken up. 15.1.1955: Grimsby registry closed “Vessel broken up”. 11/05/2010: Page published. 5 updates since then. This entry was posted in Non Fleetwood Vessels, Steam Trawlers, Steamers (Picture) and tagged Boston DSF & I, Parkes, Parkholme Trawlers on May 11, 2010 by Fred Smith. 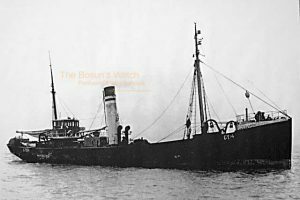 9.11.1915: Launched by Cook, Welton & Gemmell Ltd, Beverley (Yd.No.336) for The North Western Steam Fishing Co Ltd (64/64), Grimsby as NOVELLI. 4.4.1916: Registered at Grimsby (GY889). 4.4.1916: Alick Black appointed manager. 18.5.1916: Completed. Requisitioned for war service as a minesweeper (1-12pdr, 1-7.5” A/S Howitzer) (Ad.No.3279). 5.12.1916: Vessel mortgaged to Union of London & Smith’s Bank Ltd, London (A). 5.2.1917: Sold to Rowland Hill (64/64), Grimsby. 5.2.1917: Vessel mortgaged (64/64) to National Provincial Bank of England Ltd, London (B). 5.2.1917: Walter Harold Beeley designated managing owner. 17.9.1917: Rowland Hill sold (4/64) shares to Walter Harold Beeley (4/64), Grimsby. 18.9.1917: Walter Harold Beeley appointed manager. 18.9.1917: Rowland Hill mortgaged (60/64) shares to National Provincial Bank of England Ltd, London (C). 20.2.1918: Sold in two Bills of Sale to Great Northern Steamship Fishing Co Ltd (64/64), Hull. 22.2.1918: William Richard Nowell appointed manager. 4.3.1918: Registered at Hull (H592). Based Portland. Post 12.3.1919: Returned to owner at Hull. 30.5.1919: Sold to John Edward Rushworth (64/64), Grimsby. John Edward Rushworth designated managing owner. 12.6.1919: Registered at Grimsby (GY361). 20.6.1919: Sold to The Shaftesbury Steam Fishing Co Ltd (64/64), Grimsby. 20.6.1919: John Edward Rushworth appointed manager. 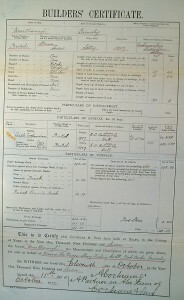 24.6.1919: Vessel mortgaged (64/64) to Barclays Bank Ltd, London (D). 25.7.1924: Sold to Harold Bacon (16/64); James Norman Bacon (16/64), both Grimsby; Arthur Gladstone Bacon (16/64), Scartho and Frederick Newton Husbands (16/64), Burton-on-Trent. 5.6.1930: Administration granted to Gertrude Catherine Bacon, Grimsby; Edwin Bacon ‘the Elder’. Grimsby and Charles George Martin, Scartho ((16/64) joint owners). 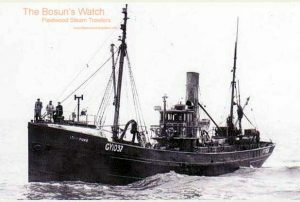 5.9.1930: Sold in four Bills of Sale to Kottingham Trawling Co Ltd (64/64), Grimsby. 29.9.1930: James Norman Bacon appointed manager. 7.12.1939: Vessel mortgaged (64/64) to Barclays Bank Ltd, London (E). 14.3.1941: Charles George Mastin appointed manager. 3.1.1944: Sold to Parkholme Trawlers Ltd, Fleetwood. 3.1.1944: Harvey Wilfred Wilson, Grimsby appointed manager. 18.1.1944: Vessel mortgaged (64/64) to National Provincial Bank Ltd, London (F). 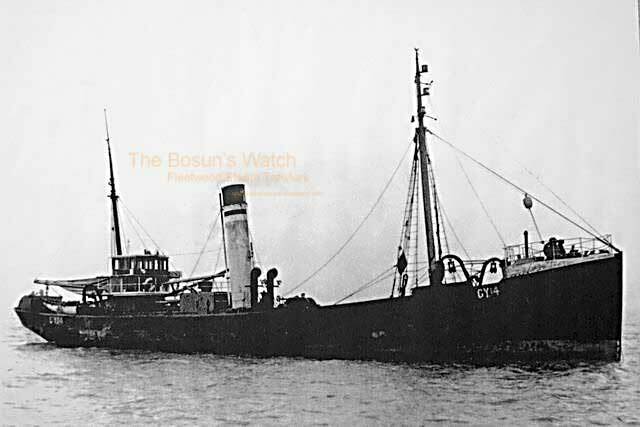 10.9.1945: Sold to Trawlers Grimsby Ltd (64/64), Grimsby. 10.9.1945: Charles George Mastin appointed manager. 6.8.1947: Harvey Wilfred Wilson appointed manager. 23.11.1956: Sold to Yorkshire Trawlers Ltd (64/64), Grimsby. 26.11.1956: John Carl Ross appointed manager. 5.3.1959: Sold to Van den Bossche & Co, Belgium. 8.3.1959: Arrived Boom for breaking up. 11.3.1956: Grimsby registry closed “… on sale to foreigners (Belgian Subjects)”. 09/05/2010: Page published. 4 revisions since then. 15/07/2018: Removed FMHT watermark from image. This entry was posted in Steam Trawlers, Steamers (Picture) and tagged Parkes, Parkholme Trawlers on May 9, 2010 by Fred Smith. 9.11.1915: Launched by Cook, Welton & Gemmell Ltd, Beverley (Yd.No.335) for Alick Black (64/64), Grimsby (managing owner) as RIVIÈRE. 4.4.1916: Registered at Grimsby (GY893). 4.4.1916: Alick Black designated managing owner. 6.5.1916: Completed. Requisitioned for war service (1-6pdr HA) (Ad.No.1261). 14.12.1916: Vessel mortgaged (64/64) to The Union of London & Smiths Bank Ltd, London (A). 17.2.1917: Sold to William Henry Bellemy (16/64); John Edward Rushworth (16/64); William Upham Carlile Westaby (16/64) and Joseph Davison (16/64) all Grimsby. 17.2.1917: John Edward Rushworth designated managing owner. 17.2.1917: Vessel mortgaged (64/64) to Barclay & Co Ltd, London (B). 22.2.1917: Mortgagee re-styled Barclays Bank Ltd, London. 6.11.1917: Sold to The Yarborough Steam Fishing Co Ltd (64/64), Grimsby. 8.11.1917: John Edward Rushworth appointed manager. 8.11.1917: Vessel mortgaged (64/64) to Barclays Bank Ltd, London (C). 19.2.1918: Sold to Great Northern Steamship Fishing Co Ltd (64/64), Hull. 4.3.1918: Registered at Hull (H596). Based Hull. 4.2.1919: Sold to James Coombes (64/64), Grimsby (managing owner). 15.2.1919: Vessel mortgaged (64/64) to The National Provincial & Union Bank of England Ltd, London (D). 20.2.1919: Registered at Grimsby (GY14). 15.2.1924: Mortgagee re-styled National Provincial Bank Ltd, London. 4.6.1925: Sold to The South Western Steam Fishing Co Ltd (64/64), Grimsby. 5.6.1925: Sir Alec Black, Bart appointed manager. 2.11.1925: Sold to The Earl Steam Fishing Co Ltd, Grimsby. 7.11.1925: Sir Alec Black, Bart appointed manager. 21.4.1940: Requisitioned for war service on balloon barrage (Hire rate £64.0.8d/month). 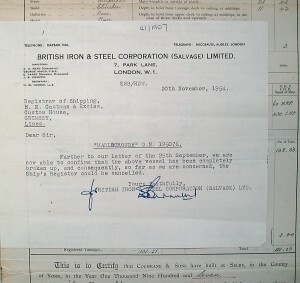 10.12.1940: Sold to Sir Alec Black, Bart (64/64), Grimsby. 12.12.1940: Sir Alec Black, Bart designated managing owner. 38.6.1942: Sir Alec Black, Bart died. 16.1.1943: Probate granted to The Public Trustee, London and John Edgar Harrison, Grimsby (64/64 joint owners). 3.2.1943: John Edgar Harrison appointed manager. 8.2.1943: Sold to Shire Trawlers Ltd (64/64), London. 10.2.1943: William Arthur Bennett appointed manager. 22.12.1944: Sold to Parkholme Trawlers Ltd (64/64), Fleetwood. 27.12.1944: Harvey Wilfred Wilson, Grimsby appointed manager. 15.1.1945: Vessel mortgaged (64/64) to National Provincial Bank Ltd, London (E). 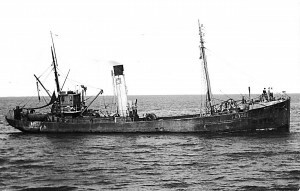 10.6.1953: Homeward from West of Scotland grounds in thick fog off Yorkshire coast when some seven miles NE of Flamborough Head struck amidships by collier FIRELIGHT (2841g/1943), shell plating stove in and foundered quickly. Despite search by FIRELIGHT and Flamborough lifeboat, Howard D, only three survivors picked up. Ten crew lost. Crew – Survivors – Walter Hand & James Gambrill, Deckhands; Alan Lorraine, Fireman. Lost – John B. Dunham, Skipper; C. F. Hanniman, Mate; W. Duncan, Third Hand; P. Conlan; R. Dolben, 2nd Eng; A. Dawn; L. Southgate; N. Sheader; H. Smith and S. Dobson. 08/05/2010: Page published. 6 updates since then. 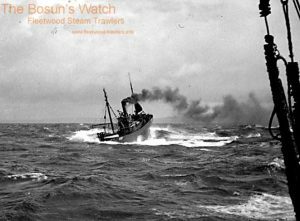 This entry was posted in Lost Vessels, Steam Trawlers, Steamers (Picture) and tagged Lost, Parkholme Trawlers on May 8, 2010 by Fred Smith. 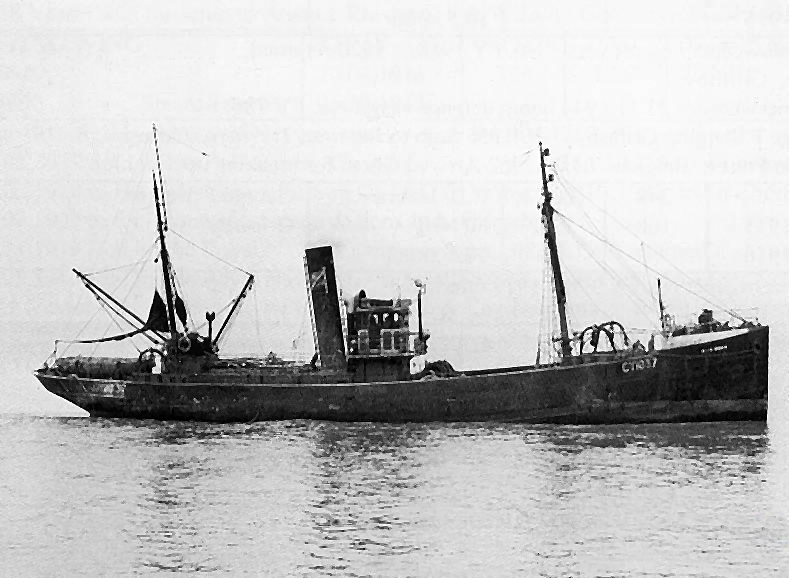 4.7.1905: Launched by Cochrane & Sons, Selby (Yd.No.348) for John L. Green, Grimsby as ROMILLY. 22.8.1905: Registered at Grimsby (GY81). 31.8.1905: Completed (Alick Black, manager). 7.1914: Sold to Denmark (to enable access to Moray Firth grounds, etc). 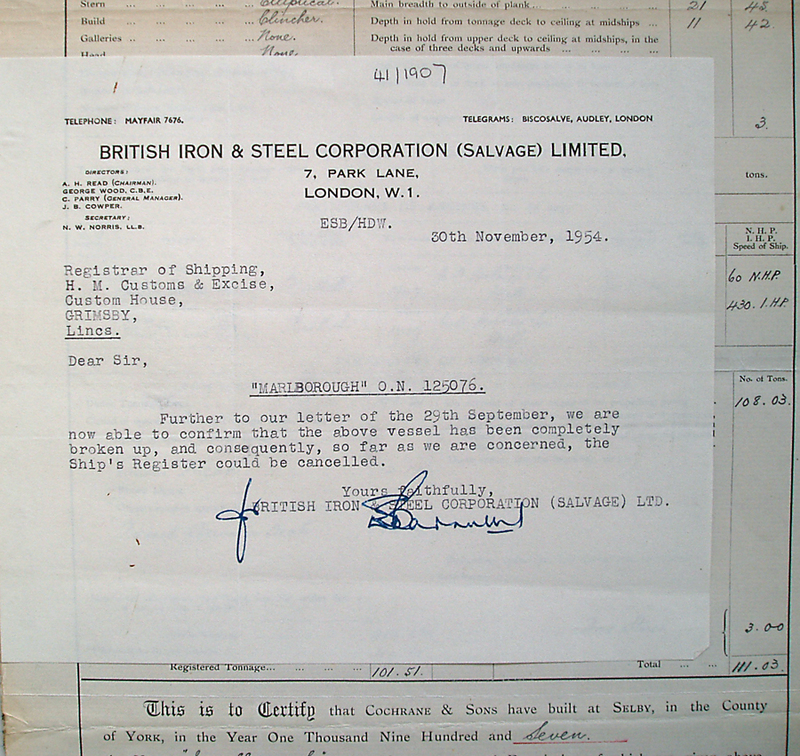 3.1915: Sold to John L. Green Ltd, Grimsby (Fred Clark, manager). 10.3.1915: Registered at Grimsby (GY437). 3.1915: Requisitioned for war service as a minesweeper (1-12pdr) (Ad.No.2651). Based Larne. 11.1925: Sold to Harold Bacon, Grimsby (managing owner). 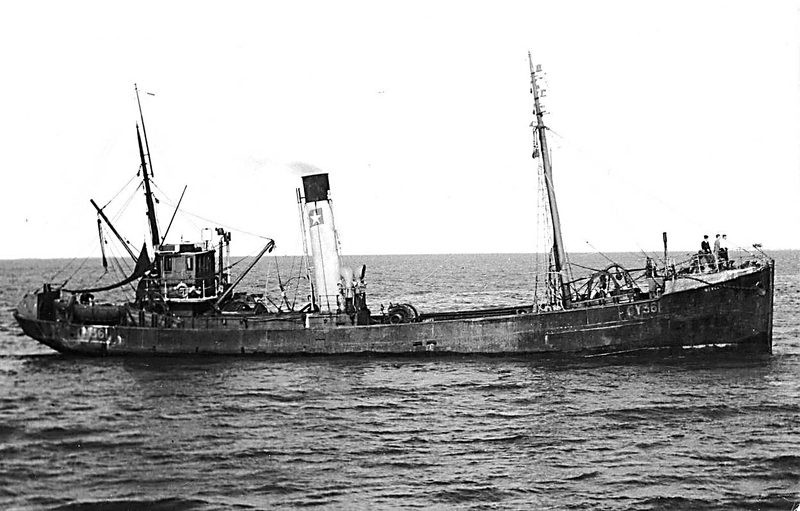 9.1930: Sold to Kottingham Trawling Co Ltd, Grimsby (James N. & Harold Bacon, managers). 1.1945: Sold to Parkholme Trawlers Ltd, Fleetwood (Harvey Wilfred Wilson, Grimsby, manager). 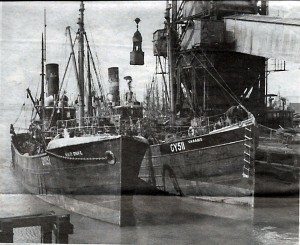 6.1945: Sold to Rushcliffe Trawlers Ltd, Grimsby. 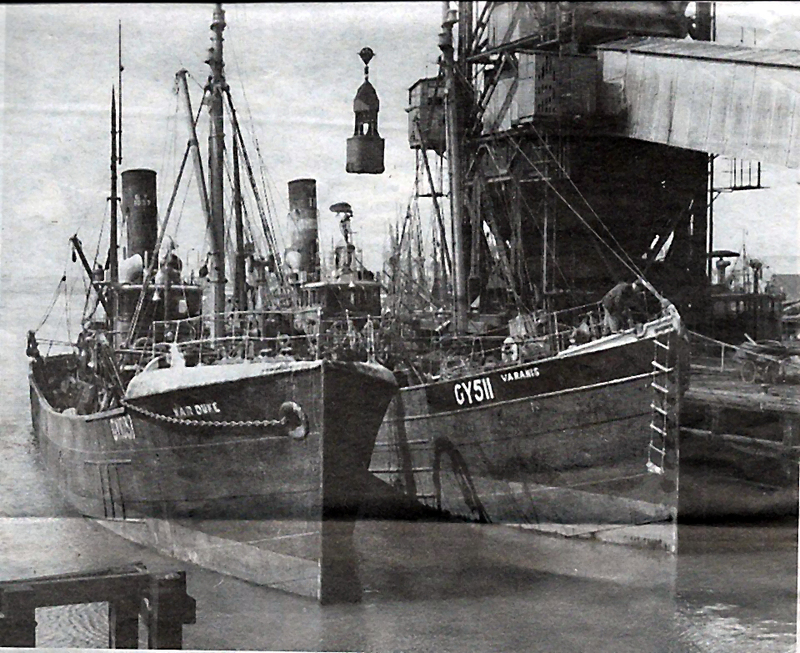 4.1948: Sold to Ravendale Trawlers Ltd, Grimsby (Grimsby Industries (Trawler Managers) Ltd, managers). 11.1952: Sold to Saint Andrew’s Steam Fishing Co Ltd, Hull (Basil A. Parkes, manager). 6.1954: Sold to BISCO and allocated to J. J. King & Co Ltd, Gateshead for breaking up. 07/05/2010: Page published. 4 updates since then. This entry was posted in Steam Trawlers and tagged Parkholme Trawlers on May 7, 2010 by Fred Smith.